The Beautyrest Ultra Comfort Cotton Mattress Protector is made from 100% cotton and is durable. 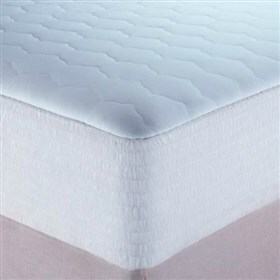 The protectors Expand-A-Grip® construction holds the pad firmly to the mattress. It has a glove-like fit to the mattress. The Beautyrest Ultra Comfort Cotton Mattress Protector - Twin Size has many exciting features for users of all types. The Beautyrest Ultra Comfort Cotton Mattress Protector - Twin Size is sold as a Brand New Unopened Item.